What's more fun? Winning against your friends or winning against others with them? It's an age old question, and in video games, the former one-on-one multiplayer has been the norm. But cooperative multiplayer has made a comeback, with Halo and Diablo II starting the trend, the first mainstream shooters and RPGs with great co-op modes. And now good local and multilplayer co-op games are available in almost every genre. It's tough to define the genres that the two games below fall under, along with what type of multiplayer mode they have exactly. They are both two-player turn-based experiences, one online and the other local, in which each of the two players acts a very different role. They also both have fairly primitive graphics and great titles. But that is about where the similarities end. The basics of Sleep Is Death. But not games in general. The closest relative to Sleep Is Death may be the great progenitor of modern gaming, Dungeons & Dragons. Sleep Is Death functions very similarly to D&D, but with a two-player limit and a timed turn system, just like competitive chess. It can only be played online, which is fine since buying one copy of the game nets you another free copy for a friend to download. One player's role is to control the scenery and NPCs, like the dungeon master in D&D. 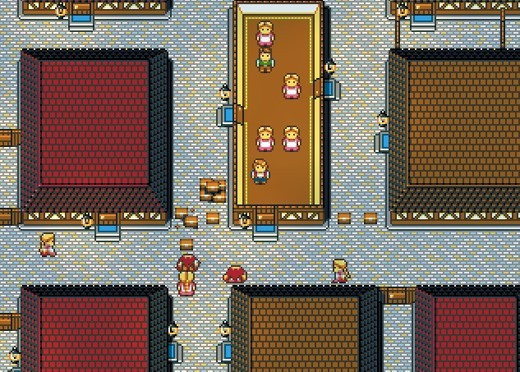 The other controls the player character in the scene created by the DM, and is able to speak, move and suggest verbs that he would like to use in the environment. Each player has 30 seconds to make their moves, starting with the DM, before control reverts back to the other player. What it looks like experts play the game. This leads to some wildly open-ended gameplay. It can be cooperative, as player work together to tell a story—or competitive, with players trying to outwit each other and mess with the other player's story. It's available here for "name-your-price" and is worth trying out if you're a raconteur, level editor or just like playing Dungeons & Dragons—or any combination of the three. Pat Kemp cut his teeth working on 3D graphics for Forza Motorsport 2 & 3, but has since become a pretty good indie game designer. Three Blind Mice is fun and uses mechanics I've never seen before, but is quite simple. Where I Go at Night takes some of the same ideas, along with a little bit of Sleep Is Death, and makes something unique. The game is played by two players using the same keyboard. One controls the human form of the game's hapless protagonist, the other his werewolf alter ego. The game cycles between day and night, which are the turns of the respective players. During the day, the human player can wander the town where the game takes place, building barricades (the little boxes piled up in the image below) in an effort to trap himself so that when he turns into a werewolf, he will be unable to eat the townsfolk. The human scores points by finding hidden elixirs throughout the map. When night falls, the werewolf player takes over. They can destroy barricades and eat townsfolk, earning points for doing the latter. After three days, the players switch roles, play three more days, then the final score is tallied and one player claims victory. It's a solid little game. The barricades for the human player seem to be ineffective... and he walks really slowly, which made him less fun to play than the wolf. Ultimately, it doesn't have the replay value or emergent storytelling potential of Sleep Is Death, but does have cleaner (albeit simpler) graphics and a really cool 8-bit soundtrack by µB. It's a free in-browser game, available here, and is fun to play with anyone once or twice, at least. Kemp has a lot of good ideas. His website claims he's interested in a professional game design job, so hopefully he'll get a chance to do a larger project sometime soon.